Powerful 50 Watt VHF VX2200 radio delivers top performance with power and distance. 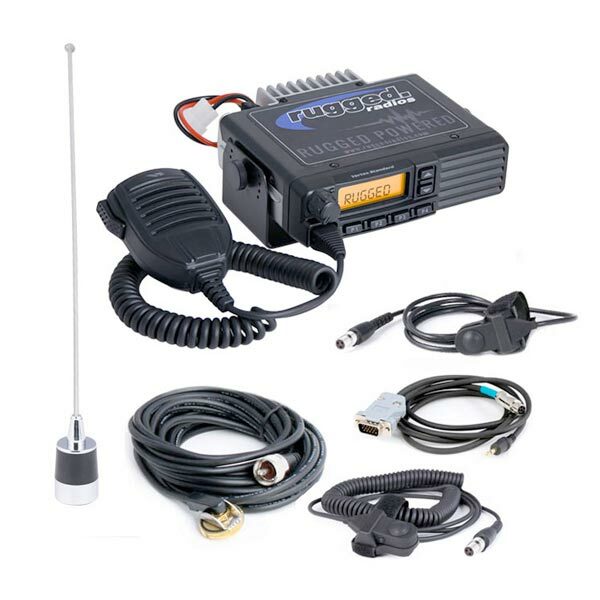 This complete kit includes radio-to-intercom adaptor, NMO antenna coax cable, tuned 1/2 wave No Ground Plane antenna with straight and coil cord PTT (Push-to-Talk). With 50-Watts of power, the VX2200 can deliver a radio range of 20~30 miles depending upon terrain. The VX2200 radio comes pre-programmed with over 75 of the most common offroad frequencies and is ready for action. Need custom programming, for an additional $20 we can program your custom channel. Wondering whether you need VHF or UHF? VHF is by far the most common and preferred frequency band for offroad enthusiasts and race teams. VHF is used by Best in the Desert, Ultra4, SCORE, and countless others. From recreation to racing, VHF is simply the preferred choice in this environment due to it’s performance factors and sheer dominance over UHF radios. In some cases, UHF may be preferred for closed course environments and specialty applications where cross-compatibility with GMRS frequencies is required. Looking for a UHF Car to Car Kit click here. Radios come with standard programming. If you need custom programming please list frequency name and frequency number if applicable in the notes at check out. An additional $20 labor charge will be added for custom programming. Click here to download Rugged Radios Installation Guide.